I've heard conflicting reports regarding the groundhog forecasts, but shadow or no shadow, I'm ready for spring. While I'm not about to start dressing for it, I have been slowly veering away from the all black everything winter in New York color palette as of late. This camel blazer and navy striped sweater combination reminds me of warmer days. I think it has kind of a nautical feel, mostly because I tend to wear this sweater most often in the summer. Long sleeves and shorts are my jam. For a casual weekend look I paired them with skinny jeans and flats - the kind of shoe you put on once you get to where you're going because it's February in New York and there are mystery puddles everywhere. PS. You can still enter the giveaway here! Great top and bag, Lyndsay! Love the look! I love the tans with the blues! Perfect match! LOVE, LOVE, LOVE this preppy look! 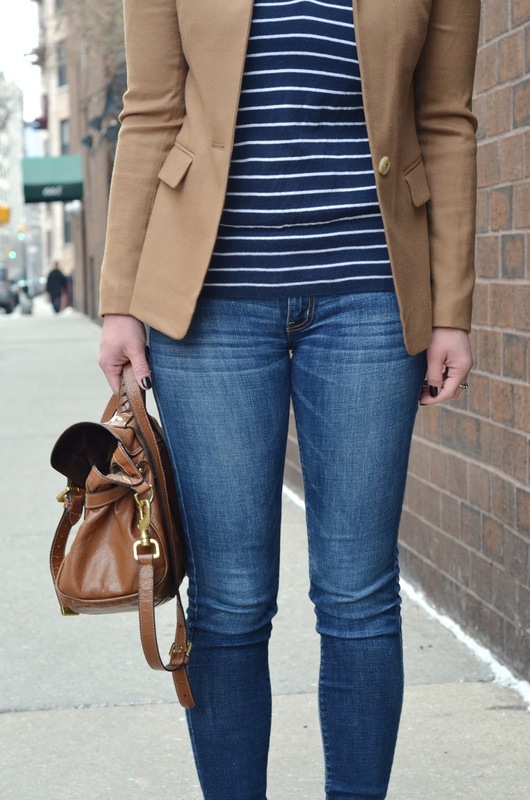 That camel blazer paired with the striped sweater is the perfect combo! I hear ya on being over the all black winter uniform. It's getting old for me too! I'm praying spring makes an early debut!! I love the stripes and those flats are adorable! Love the navy and camel combo! Such a nice look! Loving the stripes and this is such a gorgeous, timeless blazer! Ohh the navy + camel is such a great color combo. I am a fan of nautical any time of year! you make me want a winter blazer! I love that blazer, I have been looking for a camel one!